The Icelandic horse is a unique breed which developed from the horses brought over by Norse settlers in the 9th and 10th century. It's the only breed of horse in Iceland due to import laws and it's known for it's hardy nature and for the two gaits it displays in addition to the gaits common to other breeds: tölt and skeið. Icelandic horses, who are small and sturdy, are also popular internationally, both in Europe and North America. 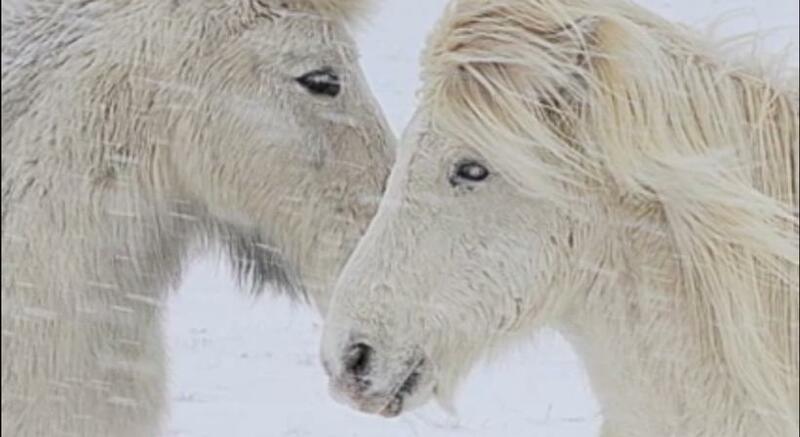 Here's a beautiful video published by Helgi Skúlason on Facebook of the Icelandic horse in winter, when it grows a thick coat of fur to withstand the harsh climate.